Discuss two dimensional collisions as an extension of one dimensional analysis. Derive an expression for conservation of momentum along x-axis and y-axis. Describe elastic collisions of two objects with equal mass. Determine the magnitude and direction of the final velocity given initial velocity, and scattering angle. In the previous two sections, we considered only one-dimensional collisions; during such collisions, the incoming and outgoing velocities are all along the same line. But what about collisions, such as those between billiard balls, in which objects scatter to the side? These are two-dimensional collisions, and we shall see that their study is an extension of the one-dimensional analysis already presented. The approach taken (similar to the approach in discussing two-dimensional kinematics and dynamics) is to choose a convenient coordinate system and resolve the motion into components along perpendicular axes. Resolving the motion yields a pair of one-dimensional problems to be solved simultaneously. 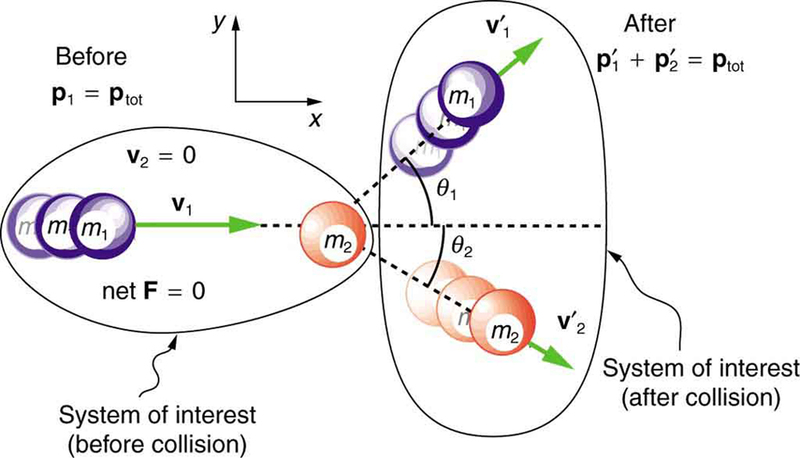 One complication arising in two-dimensional collisions is that the objects might rotate before or after their collision. For example, if two ice skaters hook arms as they pass by one another, they will spin in circles. We will not consider such rotation until later, and so for now we arrange things so that no rotation is possible. To avoid rotation, we consider only the scattering of point masses—that is, structureless particles that cannot rotate or spin. Figure 1. A two-dimensional collision with the coordinate system chosen so that m2 is initially at rest and v1 is parallel to the x-axis. This coordinate system is sometimes called the laboratory coordinate system, because many scattering experiments have a target that is stationary in the laboratory, while particles are scattered from it to determine the particles that make-up the target and how they are bound together. The particles may not be observed directly, but their initial and final velocities are. where and are as shown in Figure 1. 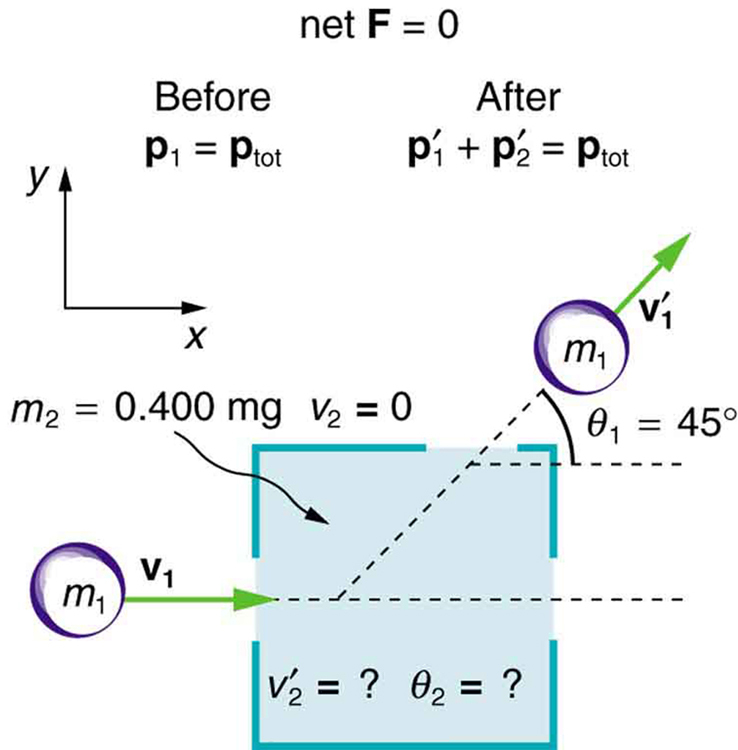 The equations of conservation of momentum along the -axis and -axis are very useful in analyzing two-dimensional collisions of particles, where one is originally stationary (a common laboratory situation). But two equations can only be used to find two unknowns, and so other data may be necessary when collision experiments are used to explore nature at the subatomic level. Suppose the following experiment is performed. A 0.250-kg object is slid on a frictionless surface into a dark room, where it strikes an initially stationary object with mass of 0.400 kg The 0.250-kg object emerges from the room at an angle of with its incoming direction. The speed of the 0.250-kg object is originally 2.00 m/s and is 1.50 m/s after the collision. Calculate the magnitude and direction of the velocity and of the 0.400-kg object after the collision. Momentum is conserved because the surface is frictionless. The coordinate system shown in Figure 2 is one in which is originally at rest and the initial velocity is parallel to the -axis, so that conservation of momentum along the – and -axes is applicable. Everything is known in these equations except and which are precisely the quantities we wish to find. We can find two unknowns because we have two independent equations: the equations describing the conservation of momentum in the – and – directions. Angles are defined as positive in the counter clockwise direction, so this angle indicates that is scattered to the right in Figure 2, as expected (this angle is in the fourth quadrant). Either equation for the – or -axis can now be used to solve for but the latter equation is easiest because it has fewer terms. It is instructive to calculate the internal kinetic energy of this two-object system before and after the collision. (This calculation is left as an end-of-chapter problem.) If you do this calculation, you will find that the internal kinetic energy is less after the collision, and so the collision is inelastic. This type of result makes a physicist want to explore the system further. Figure 2. A collision taking place in a dark room is explored in Example 1. The incoming object m1 is scattered by an initially stationary object. Only the stationary object’s mass m2 is known. 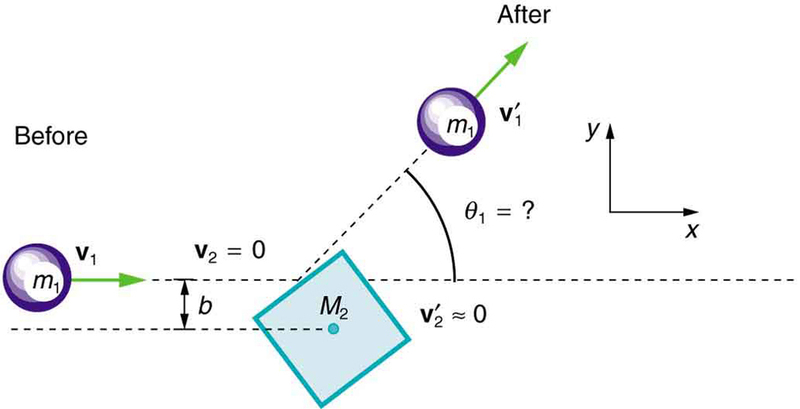 By measuring the angle and speed at which m1 emerges from the room, it is possible to calculate the magnitude and direction of the initially stationary object’s velocity after the collision. All three of these ways are familiar occurrences in billiards and pool, although most of us try to avoid the second. If you play enough pool, you will notice that the angle between the balls is very close to after the collision, although it will vary from this value if a great deal of spin is placed on the ball. (Large spin carries in extra energy and a quantity called angular momentum, which must also be conserved.) The assumption that the scattering of billiard balls is elastic is reasonable based on the correctness of the three results it produces. This assumption also implies that, to a good approximation, momentum is conserved for the two-ball system in billiards and pool. The problems below explore these and other characteristics of two-dimensional collisions. Two-dimensional collision experiments have revealed much of what we know about subatomic particles, as we shall see in Chapter 32 Medical Applications of Nuclear Physics and Chapter 33 Particle Physics. Ernest Rutherford, for example, discovered the nature of the atomic nucleus from such experiments. The approach to two-dimensional collisions is to choose a convenient coordinate system and break the motion into components along perpendicular axes. Choose a coordinate system with the -axis parallel to the velocity of the incoming particle. Point masses are structureless particles that cannot spin. 1: Figure 3 shows a cube at rest and a small object heading toward it. (a) Describe the directions (angle ) at which the small object can emerge after colliding elastically with the cube. How does depend on the so-called impact parameter? Ignore any effects that might be due to rotation after the collision, and assume that the cube is much more massive than the small object. (b) Answer the same questions if the small object instead collides with a massive sphere. Figure 3. A small object approaches a collision with a much more massive cube, after which its velocity has the direction θ1. The angles at which the small object can be scattered are determined by the shape of the object it strikes and the impact parameter b. 1: Two identical pucks collide on an air hockey table. One puck was originally at rest. (a) If the incoming puck has a speed of 6.00 m/s and scatters to an angle of what is the velocity (magnitude and direction) of the second puck? (You may use the result that for elastic collisions of objects that have identical masses.) (b) Confirm that the collision is elastic. 2: Confirm that the results of the example Example 1 do conserve momentum in both the – and -directions. 3: A 3000-kg cannon is mounted so that it can recoil only in the horizontal direction. (a) Calculate its recoil velocity when it fires a 15.0-kg shell at 480 m/s at an angle of above the horizontal. (b) What is the kinetic energy of the cannon? This energy is dissipated as heat transfer in shock absorbers that stop its recoil. (c) What happens to the vertical component of momentum that is imparted to the cannon when it is fired? A 5.50-kg bowling ball moving at 9.00 m/s collides with a 0.850-kg bowling pin, which is scattered at an angle of to the initial direction of the bowling ball and with a speed of 15.0 m/s. (a) Calculate the final velocity (magnitude and direction) of the bowling ball. (b) Is the collision elastic? (c) Linear kinetic energy is greater after the collision. Discuss how spin on the ball might be converted to linear kinetic energy in the collision. Ernest Rutherford (the first New Zealander to be awarded the Nobel Prize in Chemistry) demonstrated that nuclei were very small and dense by scattering helium-4 nuclei from gold-197 nuclei The energy of the incoming helium nucleus was and the masses of the helium and gold nuclei were and respectively (note that their mass ratio is 4 to 197). (a) If a helium nucleus scatters to an angle of during an elastic collision with a gold nucleus, calculate the helium nucleus’s final speed and the final velocity (magnitude and direction) of the gold nucleus. (b) What is the final kinetic energy of the helium nucleus? Two cars collide at an icy intersection and stick together afterward. The first car has a mass of 1200 kg and is approaching at due south. The second car has a mass of 850 kg and is approaching at due west. (a) Calculate the final velocity (magnitude and direction) of the cars. (b) How much kinetic energy is lost in the collision? (This energy goes into deformation of the cars.) Note that because both cars have an initial velocity, you cannot use the equations for conservation of momentum along the -axis and -axis; instead, you must look for other simplifying aspects. as discussed in the text. A 90.0-kg ice hockey player hits a 0.150-kg puck, giving the puck a velocity of 45.0 m/s. If both are initially at rest and if the ice is frictionless, how far does the player recoil in the time it takes the puck to reach the goal 15.0 m away? (c) The ground will exert a normal force to oppose recoil of the cannon in the vertical direction. The momentum in the vertical direction is transferred to the earth. The energy is transferred into the ground, making a dent where the cannon is. After long barrages, cannon have erratic aim because the ground is full of divots. 8.6 Collisions of Point Masses in Two Dimensions by OpenStax is licensed under a Creative Commons Attribution 4.0 International License, except where otherwise noted.